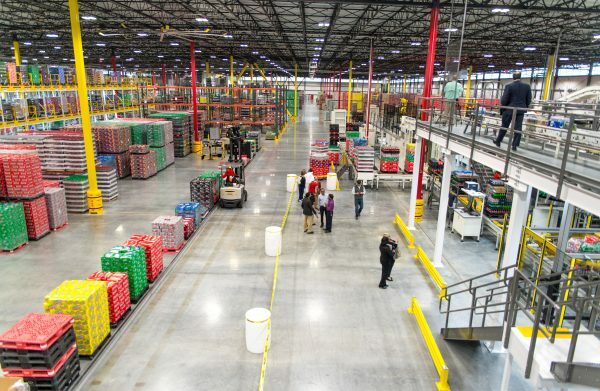 On March 1, 2016, approximately 117 years after Chattanooga became the first place where Coca-Cola was bottled, Coca-Cola Bottling Company UNITED opened a new, 305,000 square-foot facility in West Chattanooga. The decision to open this $67 million, state-of-the-art facility wasn’t the most obvious of choices. The new facility expanded on Chattanooga Coca-Cola Bottling Co.’s historic distribution reach to include Dalton, Ga., and Scottsboro, Ala.
“Financially, it was better for [this facility] to be somewhere else,” Chattanooga Mayor Andy Berke told Chattanooga’s Times Free Press. But he noted the bottler’s commitment to the community and its birthplace in Coca-Cola bottling. The decision to build in West Chattanooga preserved or created more than 500 jobs, including a leadership role for native Chattanoogian Darren Hodges, who is division director of Coca-Cola UNITED”s Tennessee Valley division. One of the bottler’s first steps in building the facility was to address infrastructure problems on the road leading to the site. UNITED wrote the city of Chattanooga a check for $260,000 for road and sidewalk improvements. This type of investment in Chattanooga is not unusual for the local Coke bottler. The city still credits much of its prosperity to Coca-Cola, which created jobs and funded local landmarks like the Tennessee Aquarium and created scholarships such as the Coca-Cola Centennial Scholarship. The interest in Coca-Cola’s roots in Chattanooga can be measured by the number of people who show up at Chattanooga’s Coca-Cola bottling and distribution centers hoping for a tour. The new facility introduced a cutting-edge warehouse and case-packing system that improves productivity and accuracy of warehouse order-picking functions. This technology improves case-loading and distribution efficiency from 7.5 million cases per year to 11 million cases per year, and distribution can be easily expanded to more than 13 million cases per year with sales growth or the additions of new brands and packages. “With the technology improvements we’ve made, we’re poised to continue growing and serving our customers, consumers, and communities in Chattanooga well through the next decade,” Hodges said.